Happy Comic Con Week! Only a few more days until Comic Con! In the meantime, I’ve got another installment of the Marvel Cinematic Universe. Next one after this is Guardians of the Galaxy and some more Agents of SHIELD. "friends" in the fall of SHIELD during "The Winter Soldier". Two years after The Battle of New York, Steve Rogers meets Sam Wilson, before leaving with Black Widow for a mission. They rescue a bunch of SHIELD agents from a hijacked boat, including Agent Sitwell. Back in DC, Fury shows Rogers three helicarriers, Project Insight, that will take out SHIELD’s enemies preemptively. Rogers visits Peggy Carter. Meanwhile, Fury runs into some problems, leading him to delay Project Insight. Later, on his way to meet Agent Hill, Fury gets attacked on the road and a mysterious masked man attempts to kill him. He escapes to Cap’s apartment and inconspicuously tells him that SHIELD has been compromised and hands off a mysterious USB drive. Fury gets shot and Cap’s neighbor bursts in, revealing herself to be Agent 13 (Sharon Carter). Later, Pierce questions Rogers about Fury’s death. On his way from the interview, Cap is attacked by an elevator full of SHIELD agents, including Rumlow, but he’s able to take them all down and escape the building. 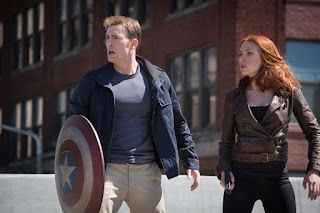 Cap reluctantly teams up with Black Widow, who tells him about the masked man, known as the Winter Soldier. They discover that they need to take Fury’s USB drive to Cap’s old military training ground, where a digitized Zola tells them that Hydra is inside of SHIELD. They barely survive an explosion and look to Sam for help. The three get information about Project Insight out of Agent Sitwell, who the Winter Soldier kills. Cap rips off Winter Soldier’s mask, discovering that it’s a brainwashed Bucky. The trio escapes Hydra with the help of Agent Hill, who takes them to a secret facility where they discover that Fury is alive. Captain America and Sam Wilson (The Falcon) break into SHIELD agents that Hydra exists in their ranks. A fight ensues as the Hydra agents (including Rumlow) launch the helicarriers. Black Widow, who snuck into the World Security Council, dumps SHIELD and Hydra’s secrets to the public, while Cap and Falcon disable the helicarriers. Amidst it all, Cap fights the Winter Soldier, trying to save his friend. After the fighting is over, Steve and Sam go looking for Bucky. Meanwhile, Strucker of Hydra continues experiments on two teenagers. In “End of the Beginning”, Agent Sitwell leaves for another mission, which leads him to the hijacked boat at the beginning of this movie. Bucky’s supposed death occurred in “The First Avenger”. Sitwell mentions “Bruce Banner” and “Stephen Strange” as potential targets of Project Insight. Zola previously appeared in “The First Avenger”. Loki’s staff, from “The Avengers”, appears in the mid-credits scene. Action packed and character building. This is what I like about Marvel movies. This episode has a wonderful lead in to Cap’s search for Bucky, which leads us into Civil War. It also changes the setting for the Marvel Cinematic Universe, making these super heroes and Avengers the authority instead of an agency like SHIELD. I also really like how it showcased Captain America’s humanity, as he is willing to do whatever it takes, even dying, to save his friend from the brainwashing. It was impossible to know who to trust in "Turn, Turn, Turn". The SHIELD team continues their mission, starting with the fall of SHIELD and leading into the aftermath of the organization falling in “Captain America: The Winter Soldier” and how it would rebuild itself from the ground up. 17. 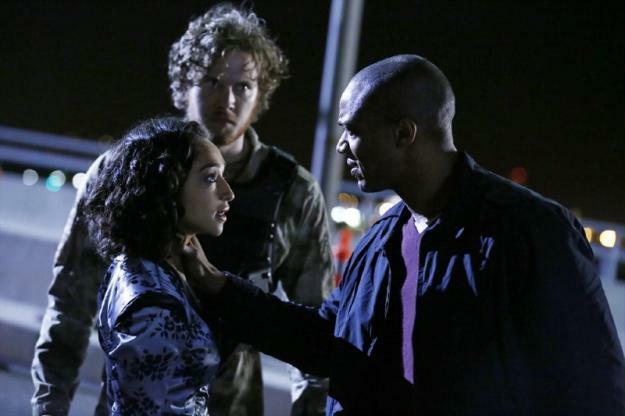 Turn, Turn, Turn: The confrontation between May, Skye, Coulsen, and Fitz resolves with May unconscious and Garrett joining them. The plane evades SHIELD while Skye discovers that Hydra is inside SHIELD. Hand confronts Simmons and Trip, confirming that they’re not Hydra agents. Coulsen pieces together that Garrett is the clairvoyant. Hand rescues Coulsen’s team from Garrett. They hear of Captain America taking down Hydra in DC. While escorting Garrett to containment, Ward betrays and kills Hand, releasing Garrett. 18. Providence: Ward and Garrett break Raina out of SHIELD prison. Coulsen and his remaining team follow a signal to an unknown location in the Arctic. Garrett and Ward raid the Fridge for 0-8-4s. Coulsen’s team uncovers the Providence SHIELD base and Agent Eric Koenig. Ward is sent to get access to Skye’s USB drive of SHIELD secrets. 19. The Only Light in the Darkness: Ward lies to the SHIELD team about what happened at the Fridge. Koenig interrogates each agent. Coulsen tracks down Marcus Daniels, who is stalking his former love interest. May leaves Providence. After finding Koenig killed, Skye pieces together that Ward is Hydra. 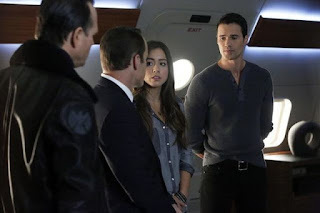 After apprehending Daniels, Coulsen, Trip, Fitz, and Simmons head back to Providence, but not before Ward leaves with Skye. Meanwhile, May gets information on Hill from her mother. 20. Nothing Personal: May confronts Maria Hill. Coulsen, Fitz, Trip, and Simmons return to Providence to find Skye and Ward gone and they find Skye’s message that Ward is Hydra. General Talbot invades the base with Hill’s help. After convincing Hill of continued danger, she helps Coulsen’s team escape to rescue Skye. In Los Angeles, Skye stalls for time, but her plan is thwarted when Deathlok appears. Deathlok blackmails Skye into cooperating. Coulsen sneaks onto the plan as they take off and he rescues Skye in Lola, his flying car. 21. Ragtag: In a flashback, Garrett recruits Ward to Hydra. In the present, Coulsen’s team infiltrates Cybertek to plant a Trojan Horse virus. Coulsen and May steal Cybertek’s hardcopy records, discovering that Garrett was the first Deathlok subject. Coulsen, May, Trip, and Skye infiltrate the Cuban Hydra base, while Ward hijacks the Bus with Fitz and Simmons on board. Ward dumps Fitz and Simmons off the Bus over the ocean. Meanwhile, Raina uses the GH-325 Serum to save Garrett. 22. Beginning of the End: Garrett begins carving something into the wall. Fitz and Simmons awake at the bottom of the sea. May and Skye infiltrate Cybertek and try to blackmail Garrett and Ward. Fitz and Simmons break out of their underwater prison and are found by Fury. Ward confronts Skye and is taken down by May. Meanwhile, Coulsen and Fury take on Garrett. With Ward and Garrett taken care of, Fury gives Coulsen the tools to be the director of SHIELD, building it back up. Later, Raina meets a man who appears to be Skye’s father. Meanwhile, Coulsen begins carving on the wall. “Turn, Turn, Turn” occurs simultaneously with “The Winter Soldier”, showing scenes of the Trikelion falling and mentioning Captain America’s success in DC. Nick Fury’s “death” from “The Winter Soldier” is mentioned in “Turn, Turn, Turn”. Items and people from previous SHIELD missions are seen at the Fridge, including the Berserker Staff from “The Well”. Trip states that he’s the grandson of one of the Howling Commandos, from “The First Avenger”. Simmons references Doctor Who, mentioning that she’d want the TARDIS on a desert island, while being interrogated by Koenig in “The Only Light in the Darkness”. Pepper Potts and Tony Stark are mentioned, as Maria Hill’s new employers. I know several people who have criticized Agents of SHIELD because it was hard to get into. Granted, I started watching Agents of SHIELD over a grave shift, so it only took me two weeks to get through seasons one and two, but this is the point when it really gets good. Instead of being an episode to episode, CSI type story, it becomes an overarching story that begins to draw in other parts of the Marvel Universe, including the Kree, Asgardians, and (in season 2) the Inhumans. Before this point it was like Agents of SHIELD was picking up the scraps of the Marvel movies with Extremis and Asgardian relics, but beginning here and moving on into season 2 the SHIELD team begins to delve into things of their own. Minecraft users have created some incredibly cool builds, from Minas Tirith to a scale replica of Westeros. For the Mormon crowd though, an innovative fan has built several temples for geeks and the faithful to enjoy. I could say more, but honestly, the artist Justin Tate is far better at explaining it than I am. 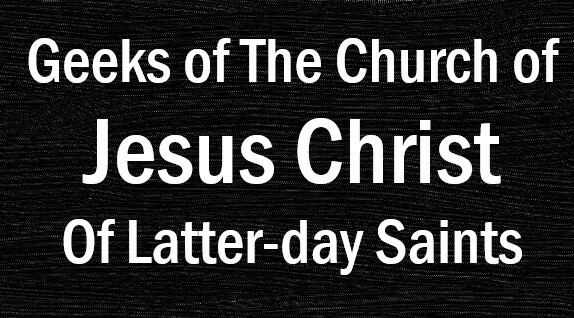 Well ever since Elder Bednar challenged us to share the Gospel on Social media I have felt that is important since that is the direction the world is headed. I have wanted to think of a creative untraditional way to share the gospel. Since I have many hobbies such as BMX, flute music, and gaming, I wanted to somehow reach people who are interested in the same hobbies as me. I only recently thought of this as a way to do that while playing Minecraft with my kids. It's a game we enjoy playing together because it is very family friendly compared to many of the games out there. Since we play together creating our own digital world, I decided to build a temple so that we could always have a beautiful temple in view while we are playing. The first one was the Bountiful Temple, where my wife and I were married. That was when we only played on The mobile version, Minecraft Pocket Edition. Then after we started playing the Xbox One edition I needed to build a new temple in that world so we could still always have a temple in sight while we play. This time I made the Washington DC temple since that is our home temple in real life. 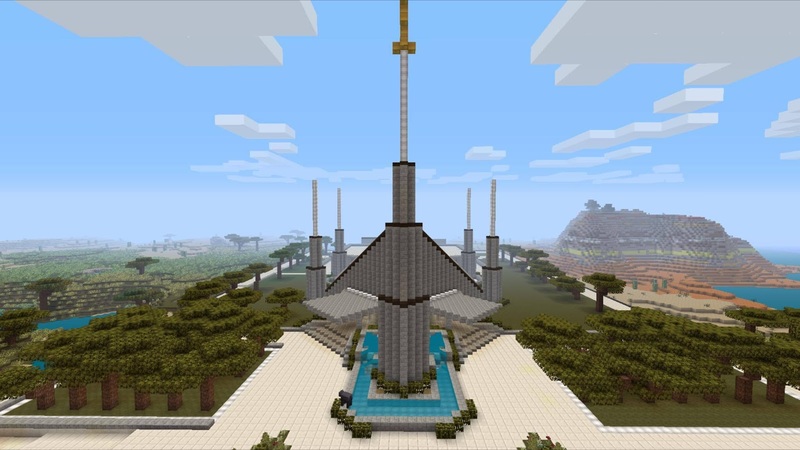 So I decided to make a Facebook page where I could collect all my LDS themed Minecraft creations together in one place and hope that some other people may enjoy seeing it. I also hope that other people will contribute their own LDS themed Minecraft creations so they can be shared with other people too. I have always thought that if my efforts can at least uplift one person than it is worth it because "Remember the worth of souls is great in the sight of God;" (D&C 18:10). So anyway, it may not change the world, but I'm just happy to see that several people have enjoyed my work so far, and a couple people have said how it has uplifted them already and that makes me happy to know. Hopefully I will be able to reach some people within the gaming community who may have not otherwise heard of the church. As for what mode, definitely creative mode haha. As impressive as it would be to gather all the materials in Survival mode, I simply don't have the time for that. It's hard to say how long it takes because so far they have been very different. To be honest, the DC temple was actually very easy to make and only took me about a week of working whenever I had a little spare time here and there. So it only took a few hours. The Preston and Mesa Temples on the other hand proved to be much more technical and time consuming. As I practice, I am naturally learning little techniques to speed up he process. With my next two temples, I have done a lot more planning and measuring before hand, which I think will help to speed up the process even more. We shall see how that goes. But as of now, I think it's safe to say that they take roughly a month or so to complete. My life schedule is very busy so I spread these projects out over an extended period of time. Since Temples come in several general styles, I want to do one from each style, so they don't blend together and look the same. I also want to feature some lesser known temples. You know the big ones like Salt Lake, DC, and Hawaii for example get a lot of attention so I want to surprise people by featuring their temple that maybe wouldn't be the first to come to mind when thinking about temples. Because they are all beautiful to me. The first three were significant to me because of my marriage(Bountiful),where we live now(DC/Maryland), and where my full time mission was(England), but after that, I'm wanting to do them for other people. As an established Mormon Geek, I’ve shown that I have an affinity for Disney movies. I’m also getting into Marvel more and more. Recently it occurred to me that we’ve got quite a few Disney characters who have some super powers of their own. Now obviously there are characters like The Incredibles and Super Goof, who explicitly have super powers, but I’m talking about more subtle characters. These characters have something inherent to them, possibly magical, but more than just the “regular” kind of magic. Snow White, Cinderella, Princess Aurora, and Mowgli have all shown the ability to talk to animals. 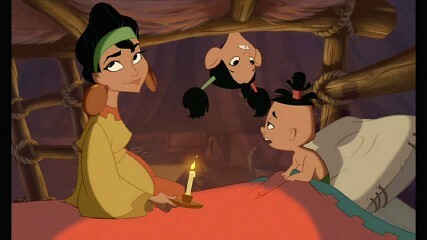 Granted, Mowgli grew up with them, but still it’s kind of weird that he hears their voices. Snow White and Cinderella even get their animal friends to help with the cleaning (I could use their help with unpacking right now). And then there’s Princess Aurora, who is so deprived of human interaction that she dances with animals. Maleficent and Jafar both show the ability to shape shift. 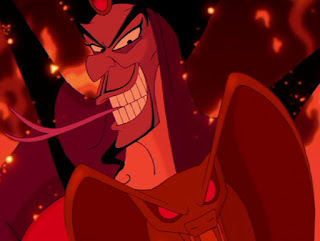 Maleficent has only been shown to transform into a dragon, but Jafar has transformed into an old man AND he’s turned into a snake. Pretty good powers for these super villains. Of course Elsa and her ice powers had to make this list. It could just be considered magic, but with such a specific kind of magic, this is more like Ice Man or Frozone (who, by the way, I’m tired of seeing fan art with him and Elsa together… Frozone is married… and she is the greatest good he is EVER gonna get). Next we have a hero and a villain. Both Facilier and Pocahontas have been able to talk to spirits. Facilier, as the villain, talks to the evil spirits. Pocahontas more often talks to the spirits of the trees, the wind, etc. Not the most useful power in fighting super villains, but still a super power in my books. Rapunzel of course has healing powers. Before it was cut, her hair was the outlet for her powers, strong enough to keep Gothel alive for over a decade. 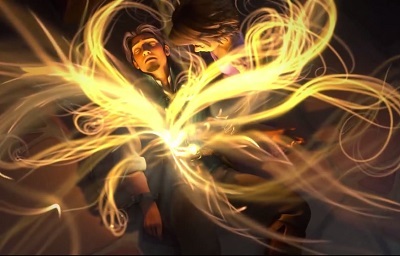 However, even after her hair was cut, her tears had healing powers enough to save Eugene from dying from a stab wound. It’s unknown whether she still retains this power, but I like to think that she does. Time for the first non-human hero: Dumbo and his ability to fly using only his oversized ears. At first it seemed like he’d only be able to fly with the help of his magic feather, but it only took one leap of faith for Dumbo to learn that he could fly on his own. Now, I doubt the timid elephant would be much use in a fight against super villains, but he could help out I guess. Much like Thor and the Hulk, Hercules and Stitch get their super strength from their heritage and experimentation respectively. 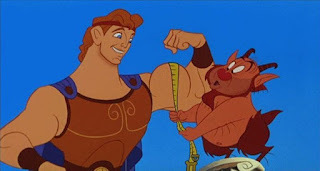 We don’t exactly know the limits of Hercules’s strength, but Stitch is able to lift 3000 times his weight. These two would be quite useful if we ever needed a Disney character Avengers team. 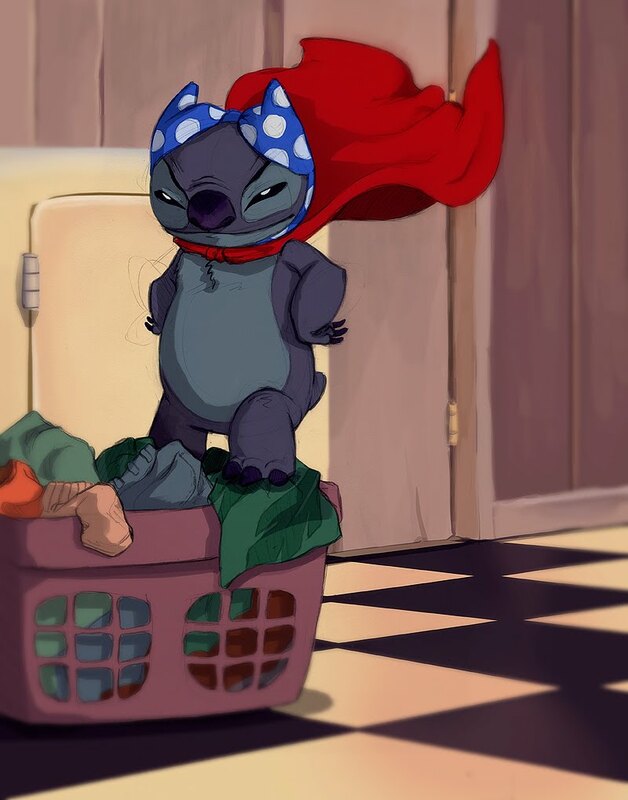 Personally, Stitch is top on my list. The extra arms are definitely a bonus. This could have been put up with Aurora, Mowgli, Snow White, and Cinderella, but Kronk is able to talk specifically to squirrels. Now this could be a learned skill and he’s not much of one to be on this super hero team, but he could be useful for developing intelligence… even if he lacks his own intelligence. Regardless, Kronk needs to be acknowledged. As I noted a few weeks ago, there was something not fully explored with Pacha’s kids: Tipo and Chaca. When Pacha was in trouble, these two both seemed to have visions of his peril…. And having to (almost) give Llama Kuzco mouth to mouth. Even more impressive is later when Yzma charges out of their house, Tipo and Chaca have this ability to appear throughout her tumble down the hill (multiple times) and then be back at the top when Kronk leaves. I’m just saying that they must have some sort of super speed and/or teleportation to get around that fast. Who else would you add to our list of Disney Avengers? It’s been about a month since Pokemon Go came out. It became a fad, it had more than its fair share of technical problems, and it’s started to slow down a bit. I think the last update annoyed a bunch of players, but I guess I’m ok with that, since there’s more server space for the rest of us true geeks now. Anyway, one of the funnest parts of the game for me has been seeing Pokemon in some of the most random places with the augmented reality feature. Or in the most appropriate places too, I guess (I haven’t played Pokemon Go at the gym much, but I’d love to catch a Machoke there). So here’s a tribute to some of the random places I’ve found Pokemon. I'm gonna seriously need to sanitize this Goldeen afterwards. Eevee came to see the Hill Cumorah Pageant! Ah! There's a girl (Nidoran) in my bed! Caterpie tried to stow away in my luggage after Pageant. I made a new friend during Institute. Who let a dog into the gym? I think the house that I work in is haunted. My dad didn't even know he was petting a Pidgey. What are some of the great places you've seen Pokemon during your Pokemon Adventures? Let us know and I'll see you next week for another Disney post. 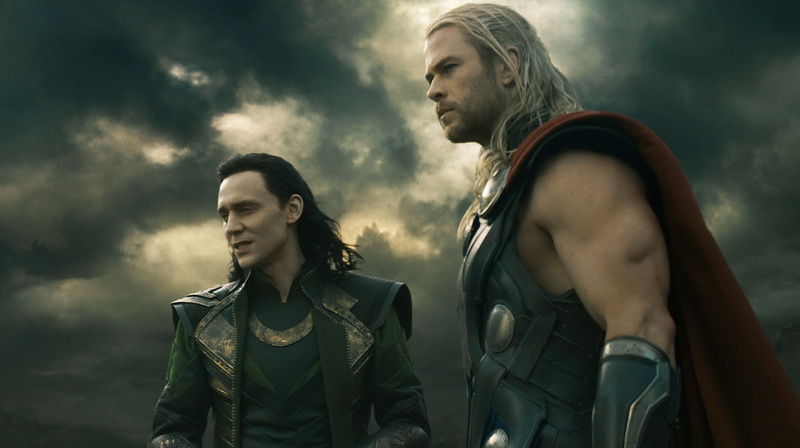 Loki and Thor briefly team up in "Thor: The Dark World". Long ago, Odin defeated the Dark Elves, but some escape and hide in suspended animation. In the present day, Loki is incarcerated after the attempted Chitauri invasion on Earth. Meanwhile, Thor and his friends are cleaning up messes that resulted from the bifrost being broken. Meanwhile, on Earth, Darcy interrupts Jane on a date and they go find a special anomaly in England. In dealing with the anomaly, Jane falls through a portal of sorts. Thor is alerted that she’s not on Earth and goes to find her. She wakes up on Earth, hours after disappearing. After Thor arrives, they discover that she has absorbed something the other realm and he takes her away from Earth. While Jane is on Asgard, Odin realizes that it’s the Aether. Meanwhile, because the Aether has been found, the Dark Elves awaken. In the struggle of the Elves attacking, Thor’s mother is killed. Thor decides to team up with Loki to get Jane off Asgard. Loki appears to sacrifice himself in helping Thor fight the Dark Elves’ leaders, who takes the Aether from Jane. After returning to Earth, Jane and Thor get help from Selvig, Darcy, and Ian to defeat the Dark Elves. After the battle ends, Volstagg and Sif visit the Collector to have him take care of the Aether, which is one of the Infinity Stones. When Jane meets Loki, she slaps him, because of what happened in New York. The wars that Thor and his friends are dealing with are the direct aftermath of Loki’s aggressive actions in “Thor”. Erik Selvig’s mental problems are a direct result of being controlled by Loki in “The Avengers”. Loki briefly disguises himself as Captain America, to make fun of Thor. The Collector later appears in “Guardians of the Galaxy”. I’ve heard a lot of critiques about Dark World. However, I can’t completely have a negative opinion about it. I mean, we get more of Darcy! How can you hate Darcy? Even though Jane won’t be coming back any time soon (thanks to contract disputes and such), I’d love to see Darcy pop up in another movie sometime. This was also a good place to start with “introducing” the Infinity Stones. Sure we saw the Tesseract before, but this one is more explicit about it, especially after seeing Thanos at the end of “The Avengers”. In "The Bridge", Mike trades Coulsen for his son. 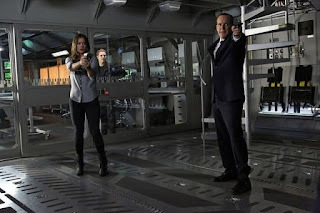 The specialized SHIELD team of Coulsen, May, Fitz, Simmons, Ward, and Skye continue on their missions, starting with the aftermath of “Thor: The Dark World” and leading up to “Captain America: The Winter Soldier”. 8. The Well: The team cleans up the aftermath of “Thor: The Dark World”, while a couple in Norway find an Asgardian staff giving them super strength. The team comes to check the scene out and end up on the hunt for the couple. With the help of Elliott Randolph (who turns out to be Asgardian) the team track down the Berserker Staff. Having touched the staff, Ward is incapacitated by memories from his childhood. May is finally able to retrieve the staff, using her emotional coping mechanisms. 9. Repairs: The teams is brought in to investigate a woman (Hannah) who is apparently telekinetic. During their investigation, they discover a man (Tobias) who is stuck in an alien dimension. After Tobias starts sabotaging the Bus, May discovers that Tobias has been out to protect Hannah, phasing in and out of our dimension. 10. The Bridge: Skye searches for leads to her past. Reluctantly, the team gets help from Mike Peterson to look into a break-in, involving Centipede soldiers. Meanwhile, Raina looks for guidance from the Clairvoyant. After a scuffle with the Centipede soldiers, Mike calls his son, only to find out that Raina is with him. Coulsen agrees to trade Mike for his son, but they take Coulsen instead. Later, Raina reveals that she wants to know what happened after Coulsen died. 11. The Magical Place: The team searches for Coulsen, after Skye gets kicked off the Bus by Victoria Hand, with May’s approval. Meanwhile, Edison Po reveals that the Clairvoyant can’t see what happened to Coulsen after he died. Skye tricks a Centipede financer to help her track the money trail back to Raina. Coulsen agrees to let Raina uncover his memories. Skye regroups with her team to rescue Coulsen, who has learned of the TAHITI procedure, which revived him after his death. Meanwhile, Mike Peterson is told to await instructions. 12. Seeds: At the SHIELD academy, a couple of students get killed in a sudden freeze at the pool. The team is brought in to investigate. After another sudden freezing, Fitz takes an interest in Donnie Gill and helps him complete a project. 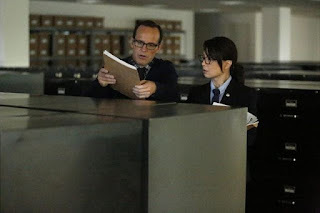 Meanwhile, May and Coulsen look for answers about Skye’s past, discovering that she’s considered dangerous. At the academy, turns out at the Donnie and his friend Seth are behind the freezing. Before they can sell their idea to Ian Quinn, they’re stopped by the team. 13. TRACKS: The team goes undercover on an Italian train. However, not long into the mission, communications go down. After getting chased off the train, Ward and Coulsen get frozen by an dendrotoxin bomb. While they’re frozen, May (who has already fled the train) gets them out of harm’s way. She had been captured by Coulsen’s Italian police contact, who she follows to the Bus and kills, just in time to save Coulsen and Ward. Meanwhile, Fitz and Skye trace the target to Ian Quinn. When the rest of the team catches up with them, Skye has already found Mike Peterson in stasis. Quinn shoots Skye, against the Clairvoyant’s wishes. The team captures Quinn and puts Skye in the stasis chamber to save her. 14. TAHITI: The team tries to find the facility that saved Coulsen, so that they can save Skye. Because they haven’t taken Quinn to the Fridge yet, they are intercepted by Agents Garrett and Triplett. They agree to help, to interrogate Quinn on the plane. The Bus lands at “the Guest House” where the team finds the GH-325 serum that saved Coulsen. They blow up the Guest House on their way out, but not before Coulsen discovers that the GH-325 serum is derived from Kree blood. Meanwhile, in Death Valley, an Asgardian appears. 15. Yes Men: An Asgardian named Lorelei starts using her powers to create a posse of men to follow her every command. Meanwhile, Simmons is testing Skye for any irregularities after being injected with the GH-325 serum. Lady Sif arrives and teams up with SHIELD to find Lorelei. However, in taking on Lorelei, Ward is taken over as well. Ward and Lorelei take control of the Bus, with Fitz in tow. Finally, Sif is able to capture Lorelei, breaking the spell on the men. After Sif and Lorelei leave, Coulsen has a one-on-one with Skye, which is overheard by May. 16. End of the Beginning: Trip and Garrett search for the Clairvoyant off the Index’s rejects, but run into Mike/Deathlock. Later, Agents Hand, Garrett, Trip, Sitwell, and Blake join up with Coulsen’s team to track down the Clairvoyant. Skye (recently made an official agent) randomly assigns them to missions to track it down. Deathlock attacks May and Blake, putting Blake in critical condition. 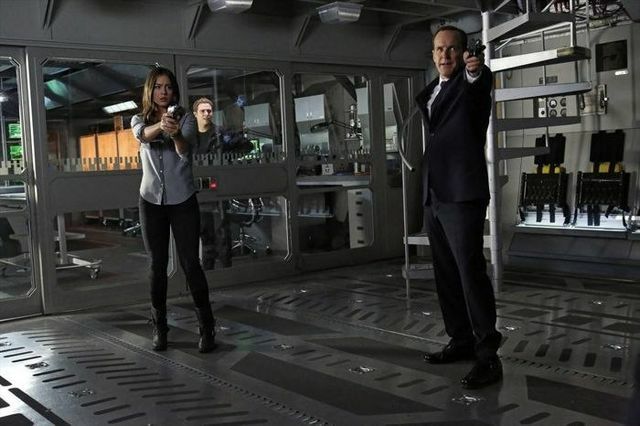 Coulson, Ward, and Garrett track down Nash, their prime suspect for the Clairvoyant and Ward shoots him at the mention of Skye. On the Bus, Fitz discovers an encrypted line, which is traced to May. Skye and Coulsen realize that the Clairvoyant is a high ranking SHIELD agent. Skye, Coulsen, and Fitz confront May, when suddenly the plane shifts course, Meanwhile, Nick Fury is being shot at in DC. serious in "End of the Beginning"
In “The Well”, both Thor movies are referenced as we see snippets from The Battle of New Mexico and The Battle of Greenwich. Multiple Asgardians are seen, including Randolph and Sif. Bucky Barnes’s name is seen on the Wall of Valor at the SHIELD Academy in “Seeds”. Baby Skye is revealed to be an 0-8-4. Blonsky, the Abomination from “The Incredible Hulk”, is referenced by Coulsen in TRACKS. It is stated that Lorelei escaped Asgard during the events of “Thor: The Dark World”. When Coulsen and Sif see each other in “Yes Men”, they recall meeting during the events of “Thor”, but she also recalls Thor indicating he’d died in “The Avengers”. In “End of the Beginning”, Sitwell is transferred to the Lumerian Star, which is overrun by pirates and later saved by Captain America in “Captain America: The Winter Soldier”. The final scenes of “End of the Beginning” leads into the events of “Captain America: The Winter Soldier”, starting with Nick Fury’s car chase. I really liked how this part of Agents of SHIELD began connecting the episodes more to the movies. This is where things really got rolling and the interweaving of the show with the cinematic universe got fun. Having it just as a side story wasn’t as fun as having “The Well” and “End of the Beginning” tie into “Thor: The Dark World” and “Captain America: The Winter Soldier”. It also started giving a bit more depth to the story, instead of just episode long missions. That's all for now. Next Marvel post I'll get at the fall of SHIELD on two fronts: cinematic and television.